Minais Gerais is a state in the southeast of Brazil, north of Rio de Janeiro. It ranks as the second most populous, the third by gross domestic product (GDP), and the fourth largest by area in the country. The state's capital and largest city, Belo Horizonte, is a major urban and finance center in Latin America, and is the sixth largest municipality in Brazil, after the cities of São Paulo, Rio de Janeiro, Salvador, Brasilia and Fortaleza, but its metropolitan area is the third largest in Brazil with just over 5,500,000 inhabitants, after those of São Paulo and Rio de Janeiro. Minas Gerais is the Brazilian state with the largest number of presidents of Brazil; Brazil's current president, Dilma Rousseff, born in Belo Horizonte, is one of them. The central and eastern area of the state is hilly and rocky, with little vegetation on the mountains. The south of Minas Gerais is hilly and green, with coffee and milk production. The west of Minas Gerais, also known as "Triângulo Mineiro" (which means "the Minas Triangle", due to the geographic shape of this region), is composed of a particular type of savanna, known as the Cerrado. 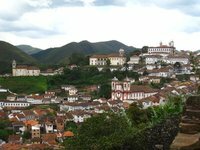 8 Trail of Tiradentes - The cobblestone streets of quaint mountain towns such as Congonhas, Ouro Branco, Ouro Preto, Mariana, São João del Rei and Tiradentes hold a great deal of colonial history, largely untouched by time. Grand churches, government buildings, and noble residences abound, their histories entwined with the local gold rush, slavery, and the Inconfidência Mineira, an important early attempt to break free from colonial rule. Many area churches bear the mark of famous architects and artists such as Aleijadinho. Tancredo Neves-Confins International Airport (CNF) is located about 40 kilometres from Belo Horizonte. Azul Linhas Aereas has its second main hub at this airport. Also, Gol Linhas Aéreas Inteligentes and Latam Brasil have regional flights from this airport. American Airlines, Copa Airlines and TAP Porutgal have international flights to Miami, Panama City and Lisbon. Because of its central position, the state is crossed by the most important national highways, like BR-116 (Rio-Bahia), BR-040 (Rio-Brasília) and others. Many of the most important Brazilian routes cross the state and, for this reason, it counts the greater proportion of car accidents per capita. This is version 12. Last edited at 13:57 on Dec 8, 17 by Utrecht. 5 articles link to this page.